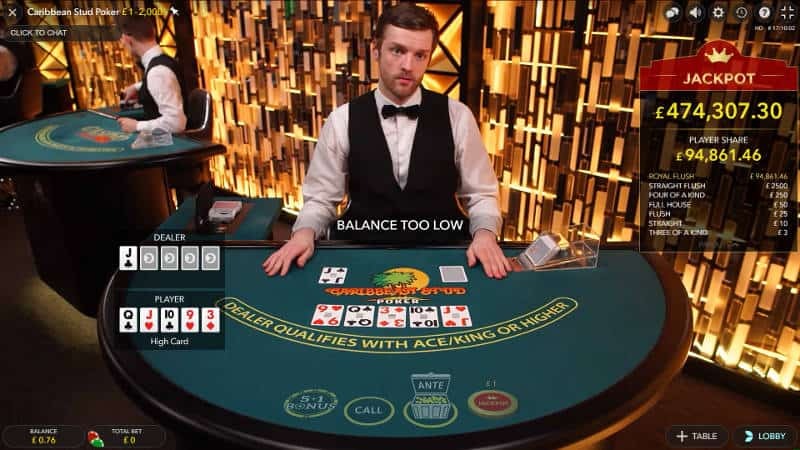 Live Caribbean Poker has been around for a few years but didn’t really hit the mainstream live casino scene until 2015 when Evolution Gaming released Live Caribbean Stud Poker. Up until then XProgaming and Vivo Gaming had Live Caribbean Poker, but its market reach is mainly South America and countries that don’t have explicit licensing rules. The Evolution version (in association with Games Marketing) opens up the whole new market that gives European players the opportunity to play this great card game. So what is Live Caribbean Poker? It’s a card game that’s played against a dealer. The player is dealt 5 cards and the dealer is dealt 5 cards. The player has to decide whether his hand will be the better poker hand than the dealer. If he thinks he can win then he can place a bet, otherwise he folds. Winning payouts are dependent on the value of the hand, and you can see more about this below. There are currently two versions of the game being played at live casinos. A 5 handed game and a single handed game. Both are played in exactly the same way. Evo, XPG & Vivo Software. The version found at XPROGaming and Vivo Gaming is a 5 handed game. This means that up to 5 players can play against the dealer. It’s a good community card game but only 5 players can play against the dealer, which makes this version rather limiting. The Evolution Gaming version is a one to many game, i.e only one player hand is dealt that any number of players can play. This is a better option as there are no restrictions on the number of people that can play. The Evolution version also comes with a progressive jackpot at some of the casinos, which gives an added incentive to play. One pack of 52 playing cards is used in the game with the cards being shuffled after each hand. Prior to the cards being dealt the player has to place an Ante Wager. The value of this min/max is displayed on the table and also in most live casino lobbies. Once all players have placed their bet the dealer deals five cards to each player and then the dealer takes five cards. The dealer turns over the last card he is dealt and shows this to the players. Each of the players examines their cards and decide whether to play the hand or to fold. If the player wants to play the hand he places a wager that is twice the amount of the initial Ante Bet. This is sometimes referred to as the Raise bet. Once all of the players have made their playing decisions the dealer will turn their cards over. The dealer must have a hand with a higher value of Ace / King to qualify to play. If he doesn’t then each of the players will win even money on their Ante bet and their raise bet becomes a push (i.e. returned to them). If the dealer qualifies and loses to the player, then the ante will pay even money and the raise bet will be paid according to the paytable. If the player and dealer tie, it’s a push and both ante and raised bets will be returned to the player. The only real playing strategy is to play hands that are greater than a High card hand such as Ace / King. It’s not worth playing hands of lesser values. 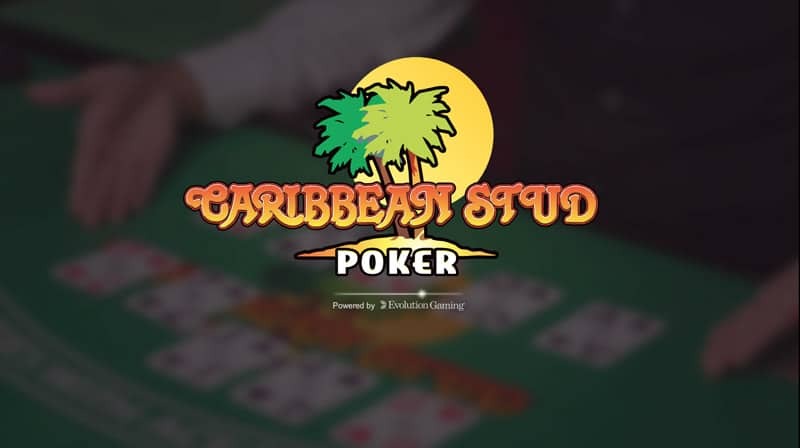 The 5 +1 Bonus side bet is available at Evolution Caribbean Stud Poker and is an optional additional bet that you can make alongside the main Ante bet. You’re aiming to make the best 5 card poker hand using the dealer’s first up card and 4 of the players 5 cards. Anything greater than three of a kind wins. Payouts are listed in the table below. This is a side bet that gives you a chance to win part of a progressive jackpot if the player hand is dealt a Royal Flush. Other prizes are available for lower value poker hands. This side bet is paid whether or not the hand beats the hand of the dealer. It’s only available at Evolution Live Casinos. In ascending order, the value of poker hands is described below. The best high card hand contains an Ace and any four other cards. In case there is a draw the next highest card in the hand is used to determine a winner and so on until either one person has the best high card hand or it’s a tie. The best possible High card hand is A, K, Q, J, 10, 8. A hand that has two cards of the same rank and three other cards. In this case, it’s a pair of 9’s. Another pair of a higher value e.g 10’s would beat this hand. If two hands have a pair of 9’s the next highest card is used to determine the winner. A hand that has two sets of pairs where each pair is different from the other. In this example, it’s 9’s and 3’s. If another hand has two pairs then the hand containing the higher pair will win. One set of 3 cards that have the same rank, with 2 other cards completing the hand. In this case, we have three 5’s. This hand would be beaten by three 6’s or above. Is a hand of 5 cards that form a run of cards in number sequence. The suits do not need to be the same. In this example, we have a run of 3, 4, 5, 6, 7. Straights with a higher run value e.g. 5,6,7,8,9 would beat this hand. A set of 5 cards from the same suit in a random number sequence. The high card in the hand is used to determine the winner and if this is the same then the next card down (the kicker) is used. A combination hand that is made up of 3 of a kind and a pair. The three of the kind is dominant in the hand and would be used to determine ties with other full houses. This hand would be referred to 9’s over 5. Live Caribbean poker has become a very popular game at live casinos. The Evolution version is available at most of their casinos, while it’s a bit harder to find the Xprogaming & Vivo Gaming versions.